L. S. Hullinger’s middle-grade paranormal mystery is a great read. The book features Cydni Hazard, a 12-year-old empath who likes to solve the mysteries associated with some of the empathic connections she makes to the dead. Cydni’s mother died when she was very young, but her aunt, Ettie, is a major female figure in her life. This book, which I hope is the first in a series, takes place in Ettie’s home town of Blue Star, Texas, where Cydni stays for a week while her father is at a convention. Cydni finds out a local pond is supposedly haunted and sets out to figure out what’s going on. Hullinger’s presentation of Cydni’s gift is interesting. For one thing, the gift is difficult to control — even difficult to recognize, at times. Cydni usually can’t see the ghosts who touch her empathically, and even when she makes an empathic connection to a living person, she often doesn’t recognize it’s happening until someone points out that she’s behaving weirdly (craving green Kool-Aid, for instance, when she normally can’t stand the stuff). In the process of investigating, Cydni often gets approached by cats that have helpful messages for her (the cat is her spirit-guide animal), but it’s not like she can have back-and-forth conversations with them — they’re still just animals. She also journals, writing down clues as she discovers them. The overall effect is that Cyndi has a paranormal advantage, yes, but it’s hardly a superpower. She still has to approach real people with questions and put the pieces together on her own. This normality is something I really like about the book — I think Cydni’s gift is spooky enough to be interesting to child readers, but Cydni herself is normal enough to provide a good role model. She’s also a very nice kid — responsible, honest, and polite. Yet she’s not weirdly perfect — she’s capable of embarrassment, annoyance, and so forth. She feels very real. So does her Aunt Ettie, who’s a professional psychic. Nice touches, such as Ettie’s tendency to answer questions with three possibilities labeled “A, B, and C,” give the secondary characters individuality. Also, the plot hangs together well, progressing through a series of interactions and investigations to a solution I really hadn’t foreseen ahead of time. The book’s overall presentation doesn’t quite live up to its excellent story: there are some punctuation and other writing-mechanics errors, though they aren’t marked enough to impede comprehension. The paragraph indenting is so deep that when I open the book on my phone, I only get a word or two on the first line of each paragraph. Lastly, the cover needs replacing. For comparison, see the covers of traditionally published books in the middle-grade-paranormal-mystery genre: The Whispering Road, The Crowfield Curse, The Red Pyramid, etc. If indie books are going to compete with traditionally published books, most will need professional editing, proofreading, and cover design. It’s not like traditionally published authors do that stuff by themselves, and neither can we. Hullinger might also consider reordering the title, if this is going to be a series. 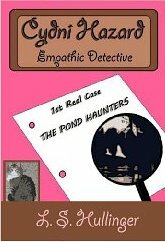 Something like The Pond Haunters (A Cydni Hazard Mystery) or The Pond Haunters (An Empathic Detective Mystery) might better follow titling conventions in the genre. As is, the unique part of the title is buried at the end. ← Quality? Of Course. Then Promote, Promote, Promote.